As promised by Rural Media Group President & CEO Randy Bernard, $2 million in total prize money was paid out. 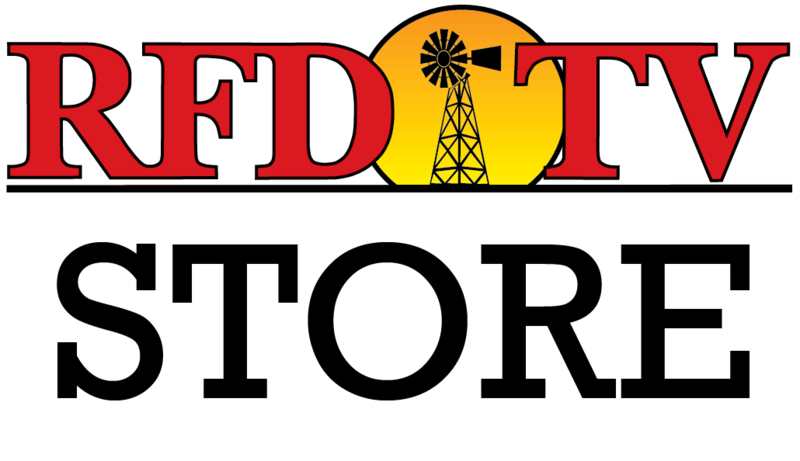 Each RFD-TV's THE AMERICAN presented by Polaris RANGER event champion received a $100,000 paycheck along with a prize package totaling more than $45,000. Champion plus qualifying Steer Wrestlers Dru Melvin from Hebron, NE and Wyatt Smith from Rexburd, ID; Tie-Down Roper Marcus Allen Costa from Sau Paulo, Brazil and two Barrel Racers Robin Herring from Huntington, TX and Shelly Anzick from Livingston, MT were all million dollar contenders. 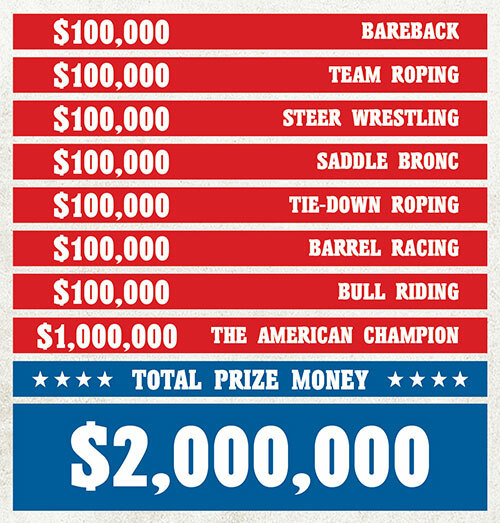 The intense pressure, long times, a missed calf and tipped barrels all played into Champion being the lone millionaire. Thirteen out of the 15 contestants made qualified rides with less than 10 points separating their scores. Climbing in the chute second to last, 21-year-old Richmond Champion rode Calgary Stampede's Twin Cherry for an impressive 84 points placing him third in the first round. Adding drama to the first round, 3x World Champion Kaycee Field scored 83 points on Harry Vold Rodeo Company's Sun Glow with the option of a re-ride. The fourth position for the shoot out was held by Bobby Mote with 83.75 points. Field took his re-ride on Smith's Pro Rodeo's Miss Dunny and tied Champion with an 84 point ride knocking Mote out of the running. Richmond Champion of Woodlands, TX was one of 46 qualifiers and nine exemptions eligible for the million dollar side pot. The action turned to steer wrestling with a field of 16 competitive, clock stopping contestants. With only three seconds separating the fastest time and the longest time posted, the competition was fierce. Two invited contestants and two qualifiers came out on top to advance to the shoot out round. Qualifiers Dru Melvin and Wyatt Smith put up times of 3.87 and 3.95 respectively to earn their chances at the million against 2013 World Champion Hunter Cure and 2x World Champion Dean Gorsuch. The event exemption, 4x World Champion Scott "Ote" Berry had the crowd on their feet, when he threw his tough steer and stopped the clock at 6.74 seconds. The reigning World Champion Steer Wrestler Hunter Cure of Holliday, TX threw his steer in 3.75 seconds to claim THE AMERICAN Championship in the shoot out round. Rodeo action switched to the Team Roping side which provided non-stop speed when sanctioning body United States Team Roping Competition eliminated the crossfire rule. The most exciting action came from the Barnes' partner, Brazilian Junior Nogueira heeling. Barnes and Nogueira drew up last in the first round and needed to beat 4.69 seconds to advance. 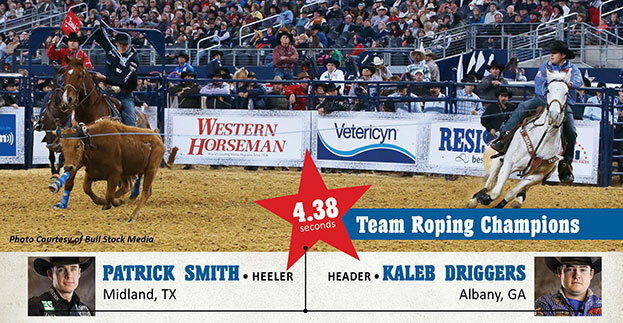 With an epic heel shot and a "pullback" heard around the rodeo world, the team stopped the clock in 4.40 seconds. The victory lap in the Polaris RANGER was taken by team ropers Kaleb Driggers and Patrick Smith who cleaned up their shoot out steer in a quick 4.38 seconds. The newly paired team roped their first round steer in 4.47 seconds to advance to the shoot out round in the fourth spot. Saddle Bronc odds were 1:4 for the Wright family in THE AMERICAN lineup. World Champion brothers Cody and Jesse plus NFR Qualifier Jake and Cody's son Rusty all competed. The exemption spot belonged to 7x World Champion Dan Mortensen, who didn't cover his bronc but received a standing ovation from the crowd. Wade Sundell kicked off the first round in a big way on Calgary Stampede's Lynx Mountain with a 90 point ride. Sundell set the bar high and none of the five qualifiers were able to reach the shoot out round. The classic event of rodeo saw Sundell come out on top, posting an even higher score in his first round, with a 92.5 point ride. He celebrated in the arena with buddy Will Lowe and went home as THE AMERICAN Saddle Bronc Champion. Tie-Down Roping brought another tough round to THE AMERICAN. Tyson Durfey took the lead in the round tying a clean, 7.51 seconds. Qualifier Marcus Allen Costa accepted the challenge and stole the lead with an exciting run, putting up 7.36 seconds. Then, 19x World Champion Trevor Brazile and 6x World Champion Cody Ohl ended up at the top with 7.09 and 7.26 respectively. Exemptions 8x World Champions Joe Beaver and Fred Whitfield both competed missing the shoot out round. Beaver symbolically hung up his piggin string as he exited the arena on the bow gate. THE AMERICAN Tie-Down Champion title was earned by Tyson Durfey who tied his shoot out calf in a quick 6.95 seconds. Charmayne James, the 11x World Champion Barrel Racer along with 70-year-old June Holeman, and Clint Sherlin were among the 21 contestants competing in the clover leaf pattern. South Dakotan, Lisa Lockhart, posted the fastest time of the day with 13.983 seconds in the first round advancing with Jane Melby and qualifiers Robyn Herring and Shelly Anzick. Lockhart was the only shoot out barrel racer to leave all of the barrels standing with a 14.035 run. She and her horse "Louie" were the winning duo and emotionally accepted THE AMERICAN Barrel Racing Championship and prize package on center stage. Last but not least, the first round of bull riding saw only six qualified rides. The 2014 PBR Iron Cowboy, Joao Ricardo Vieira from Decateur, TX put up an 88.75 ride to move on to the shoot out round with J.B. Mauney, Guilherme Marchi and Mike Lee. The Bohlin buckle that reads, THE AMERICAN Bull Riding Champion was awarded to J.B. Mauney after he posted a 90.5 ride.